West Africa served as the epicenter of the transatlantic slave trade in the 17th century. 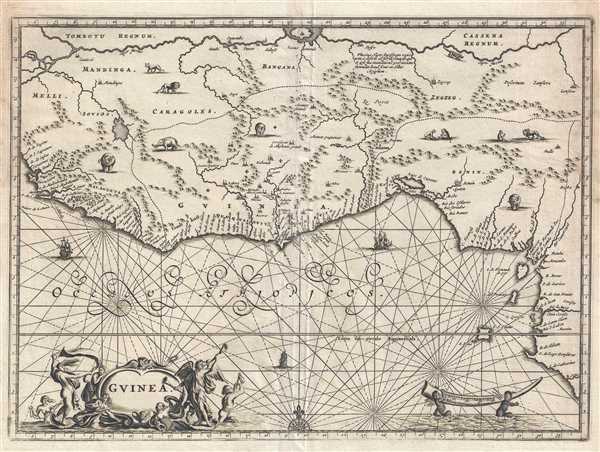 This is a 1686 Olfert Dapper map of West Africa. The map depicts the region from approximately Mali and Sierra Leone along the Gulf of Guinea to Nigeria and Cameroon and from Mali and Niger to the Gulf of Gunea. Highly detailed, numerous locations are labeled along the coast, while cities and towns dot the interior, usually along one of the rivers. The Niger River flows across the top of the map and several others flow into the Gulf of Guinea, one of which is labeled as the Cameroon River. The modern-day country names of Guinea, Sierra Leone, and Benin are present, along with the 'Gold Coast,' then a British colony, which, following its independence has been known as Ghana. Several vignettes of African animals are included as well, including elephants, lions, a crocodile, and a pair of monkeys. Two ships appear off the coast on their way to India or to purchase West African slaves. At this point in history, the transatlantic slave trade was picking up steam, particularly with Portuguese traders. The Portuguese, who viewed this part of Africa as their property, would take their newly-purchased captives to the West Indies or Brazil. West Africa was at the center of the transatlantic slave trade at this point in history. Very good. Wear along margins. Closed margin tears professionally repaired on verso. Blank on verso.